Kicking my legs off the edge of the jetty wall. It’s warm, but with a tang or two left over from the long winter. Not yet a deep summers warmth. 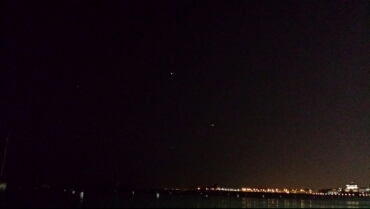 Lights from floating aircraft dance a ballet in the sky across the lake; an evolving constellation. There are a few stars poking through the luminous haze cast by the city. The water undulates, organized into waves when the stout little marina transport comes by, catching the light and forming it into twisting shapes and patterns. Beyond the waving masts and lines of the clustered boats, beyond the lake wall, beyond the glittering pier lights and flashing buoys, out into the lake, where the horizon line disappears, there is a thick dark, an expansive void, oil black and primal. Beautiful and frightening, like a great passion. If I had a boat I would sail into it, happily, and not look back.